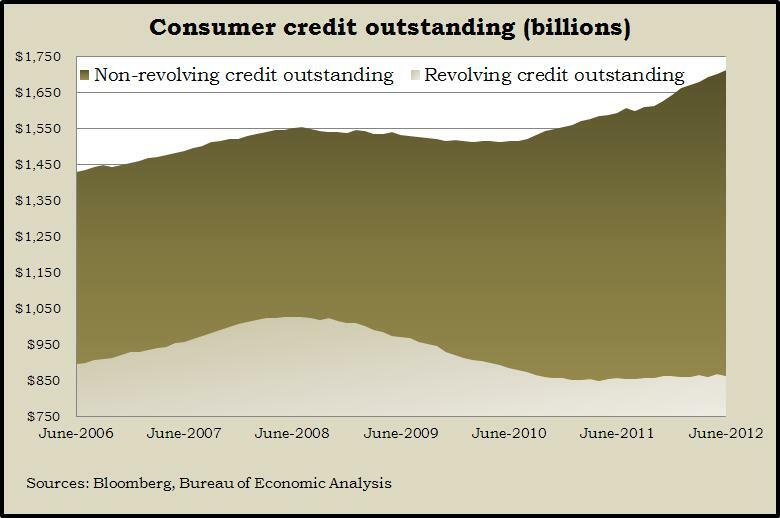 The amount of consumer credit outstanding kept growing in June and came close to the peak level set just before the financial crisis four years ago. The Federal Reserve reported that the bulk of the credit run-up continues to be in the form of student loans, car financing and other non-revolving credit. Revolving credit, which includes credit cards, dropped for the second time in three months, suggesting reluctance by consumers to spend money they need to borrow. Employers were able to squeeze more efficiency from workers in the second quarter, increasing output far more than they extended work hours. The Bureau of Labor Statistics said productivity grew by an annual rate of 1.6% in the second quarter, compared to a 0.5% decline in the first quarter. The report signaled employers’ efforts to hold off hiring until they have more confidence in business trends. The U.S. trade deficit narrowed more than expected in June as exports grew and imports receded, according to the Bureau of Economic Analysis. Lower oil prices figure into the smaller import number, but imports of non-petroleum items also shrank, perhaps reflecting a drop in consumer and business spending. The gain in exports offers hope that U.S. producers are finding ways to weather a slowdown in global economic growth. The four-week moving average of initial unemployment claims rose for the first time in seven weeks. Labor Department data show new jobless claims staying below the critical level at which employers are scrapping jobs as fast as new applicants enter the labor market. But layoff activity has been up and down since hitting recovery low in March. The Commerce Department said wholesale inventories declined slightly in June, but not as much as sales had dropped. That meant the ratio of inventories to sales rose to its highest point since early 2010, indicating that production wasn’t keeping pace with falling demand.